This is one of the most fantastic things I’ve made in a while. It’s like a Mediterranean version of Nachos. 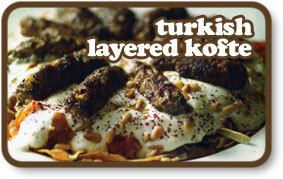 I’ve eaten this at Turkish restaurants in Sydney, but never made it at home. I must say that the home version is supreme! It’s a great communal dinner party dish that looks a lot more complicated than it actually is. It’s so simple to prepare and the results are fantastic! Top Tea!!! 2 large 12″ pitta breads or 6 small pitta breads. Firstly, get the simple things out the way. Preheat the oven to 200ºC – Bake the pitta breads for 8-10 minutes until crispy. Cool slightly then break into small pieces with your hands and set aside. In a small frying pan without any oil, dry fry the pine nuts until slightly golden and set aside. Beat the yoghurt slightly with a fork and set aside. Heat a saucepan and fry the onions gently for 4-5 minutes until soft and brown. Add the garlic and chilli, fry for 1 minute then add the tomatoes, salt & pepper. Let this come to a boil then add 1/2 cup water, stir and bring to a simmer. Cover and cook gently for 10 -15 minutes until soft. Add more water if necessary. While the tomato sauce is cooking combine all the kofte ingredients very well together with your hands. Then mould tablespoon amounts into short, fat sausages and set aside. Heat a large frying pan with 2 tablespoons of olive oil over a medium heat. Drop in the kofte and cook for 6-8 minutes, turning once or twice to brown on each edge. The kofte should be slightly springy. Remove from the heat and leave in the pan while you finish the dish. To arrange the dish, put the pitta chips in the bottom of a large serving platter. Spoon over the tomato sauce then spoon over the yoghurt. Sprinkle with sumac or paprika then arrange the kofte on top, scatter over the pine nuts, parsley, salt & pepper and serve immediately. This is a meal in itself so you don’t need anything else. Make sure you serve it quickly after arranging as the pita will soften.